Aditya Air Technics Systems is the leading Fly Catcher Manufacturers in Hyderabad. 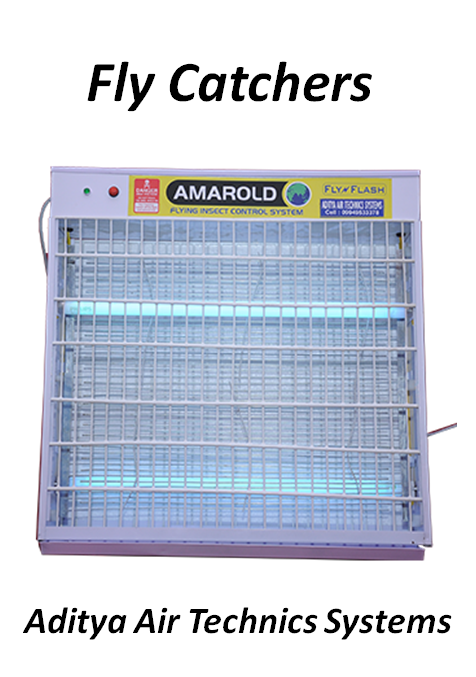 Aditya Air Technics Systems has specialised in Fly & Insect Catchers manufacturing for over a decade now. We are manufacturing best quality Fly Catchers in Hyderabad. We are the Fly Catcher Manufacturers in Hyderabad to manufacture quality and innovative Fly Catchers, Insect Catchers. Our Fly Catchers are shock proof for the human touch. It is safe to use at crowed public places. We are the largest Fly Catcher Manufacturers in Hyderabad supplying the Fly Catchers to most of the sweet shops, restaurants, public eat outs etc where the fly or insects are more and can not be controlled. The machines are technically advanced which attracts insects and flys and releases exacly very minimum electrical power to kill the insects / flys.